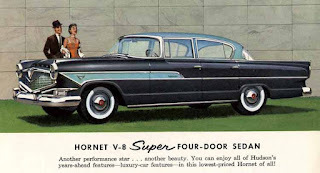 The Ambassador Custom four-door sedan was Rambler’s flagship in 1958. The car sold for $3,426. The Ambassador Country Club four-door hardtop was listed at $3,538. Oh, it was a brave new world that American Motors marched into as the 1958 selling season opened. Missing from the lineup were the two great founding names that came together in the 1954 marriage—Nash and Hudson were no more. 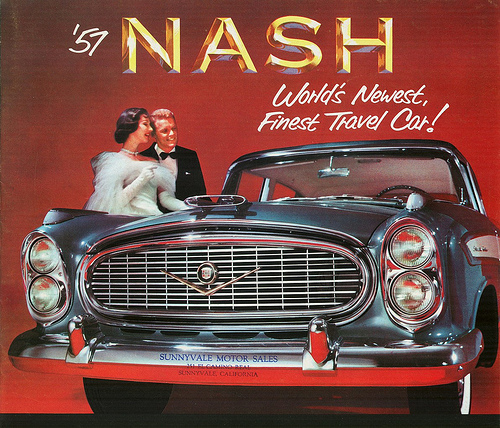 Nash was built from 1917 to 1957. Hudson was built from 1909 to 1957. Putting all their eggs into one basket, the boys in head office had bet their corporate fortunes on the compact Rambler. Well, nearly all. In place of Nash and Hudson, a posh new flagship appeared. To distinguish it from its lesser Rambler kin, the new car was subtly christened Ambassador by Rambler. Then, there was the tiny Metropolitan, a sub-compact built for American Motors and imported from the United Kingdom. Some Rambler models had been assembled in Toronto last year but the unprofitable factory was shuttered for good in July 1957. Now the entire product lineup was imported, Ramblers arrived from the United States and Metropolitans from the United Kingdom. Officials at the head office on Toronto's Danforth carefully gauged the public’s reaction as the new Ramblers were introduced to Canadians on October 22, 1957. Instrument panel of the 1958 Ambassador by Rambler featured symmetry of design and decorator-style. The Ambassador was given a 2 971-millimetre (117-inch) wheelbase, all of that extra length stretched in front of the cowl. The car was every bit as luxurious as Cadillac and Lincoln, matching them in terms of comfort and optional equipment, save power seats. Quad headlights in the fenders flanked a narrow upper grille opening in which the word “Ambassador” was spelled out. The lower grille spread across the entire front of the car. It was of an egg crate design, split at the middle by a heavy rib. A chrome guard ran the full length of the bumper and dipped into a “V” at the centre. Long parking lights and turn signals were cleverly tucked between the bumper guard and the bumper. Front fender tops were dressed to the nines in chrome windsplit and gunsight fender guides. From the side, the unit-body envelope was extremely clean, punctuated only with wheel well flares and a fuselage shape that blasted off from the trailing edge of the rear fender to culminate in a taillight. Subtle, elegant fins rose in the rear quarter panel. The understated look continued into the rear. Canted knife-sharp fender creases held ovoid tail lamps. The lights were accented with a chrome bar that ran the length of the rear deck, below a distinctive emblem and trunk lift. 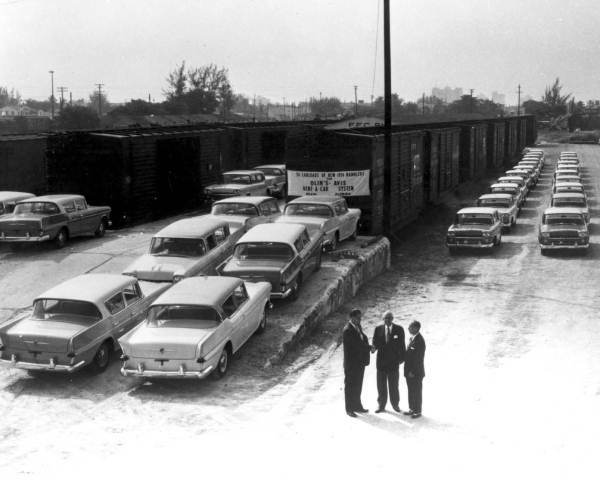 1958 Ramblers are loaded into boxcars for shipment from the factory in Kenosha, Wisconsin. In the US market, six Ambassadors were offered. Here, only four were sold, each with AM’s 5.3-litre (327-cubic inch) V-8, generating 270 horsepower. The mill transferred power to a three-speed manual synchromesh transmission or the optional Flash-O-Matic automatic transmission. Standard equipment on Ambassadors included a padded instrument panel and sun visors, an electric clock, the Airliner reclining seats and foam for the rear seat cushions. The Rambler 6 Super four-door hardtop was sold in a choice of 14 solid colours and 16 two-tone combinations. It sold for $2,874. Ramblers shared the same body shell as Ambassador. The smaller cars continued on the same 1 080-millimetre (108-inch) wheelbase they had enjoyed since 1956 but were extensively restyled. In the open upper grille, the word “Rambler” was spelled out in standup chrome letters. The lower grille was composed of large, simple chrome rectangles, their outer edges capped by an attractive ribbed section in which round parking lights and turn signals were housed. These Ramblers promised European small car economy and handling ease, rugged dependability, with the big car room and comfort that Canadians expected. The least expensive Rambler was the Deluxe Sedan. It sold for $2,598 and tipped the scales at 1 336 kilos (2,947 pounds). The Deluxe, Super and Custom made up the Rambler 6 series. All were equipped with six-cylinder engines that displaced 138 horses. The Rambler Economy 6 (left) was a 127-horsepower mill that could be bumped up to 138 horses with a Dual Throat Carburetor. The Rambler Rebel 215-horsepower V-8, with its velvety performance, is shown on the right. 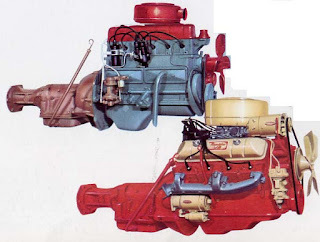 The Rambler Rebel family boasted V-8 power with a mean four-barrel carb set up. That potent little combo rated a healthy 250 horses, more than enough to allow an RCMP cruiser to eat a little dust. Ramblers were selling just fine but top brass wanted a bigger slice of the action. They could have that if they offered a vehicle in a size between Metropolitan and the Rambler 6. Deals with Austin and Volkswagen for joint production were explored but came to nothing. Making a mid-year bow was the 1958 Rambler American. The two-door sedan sold for $2,398 in Super trim and weighed in at 1 113 kilos (2,500 pounds). 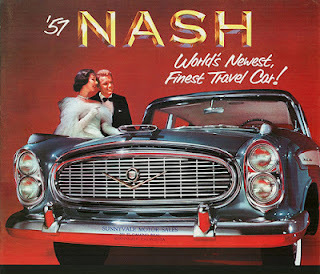 In a bold move, the 1955 Rambler was dusted off and re-introduced to the public, mid-year, as the Rambler American. Never before in automotive history had a discontinued model been resurrected. Advertising called the American’s styling “chic.” Company officials talked of calling the new model the Canadian or the 100 here in Canada but in the end that did not happen. With its emphasis on economy, boasting more cabin space than any of the small European imports and carrying a rock bottom price tag, the American was immediately popular with the practical consumer. Tried and true, folks from St. John’s to Victoria welcomed back their old Rambler friend as they struggled to take inflation out of driving. With a starting price of $2,265 for the Business Sedan and $2,283 for the base sedan, sales of the modestly appointed two-door American soared through the roof. 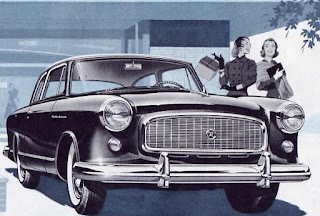 The 1958 Rambler American was the only small car—domestic or imported—that offered an automatic transmission. The American was powered by the 3.2-litre (195.6-cubic inch) L-head six that had first debuted in 1940. As thrifty as ever, it was now tweaked to 90 horsepower. 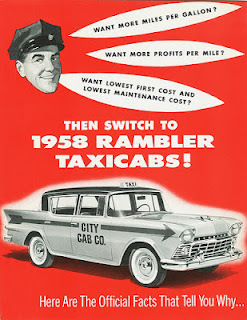 The three-speed transmission was standard equipment but advertising wasn’t shy to brag that Rambler’s American was the only small car available on the market with an automatic transmission. Ramblers could be dressed up with as many options as there are orchards in the Okanagan Valley. The Flash-O-Matic drive, overdrive, the V-8 Powr-Lok Axle, Power Steering, Power windows, power brakes, Solex tinted glass, the highly efficient Weather Eye heater or the industry first All-Season Air Conditioning. 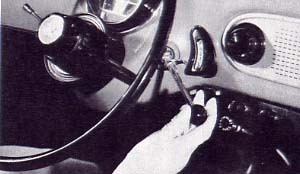 One could have the pushbutton all-transistor radio with twin speakers for the Ambassador or an extra speaker on other cars, the classy Continental tire, an anti-glare rearview mirror, heavy-duty rear springs and shock absorbers. 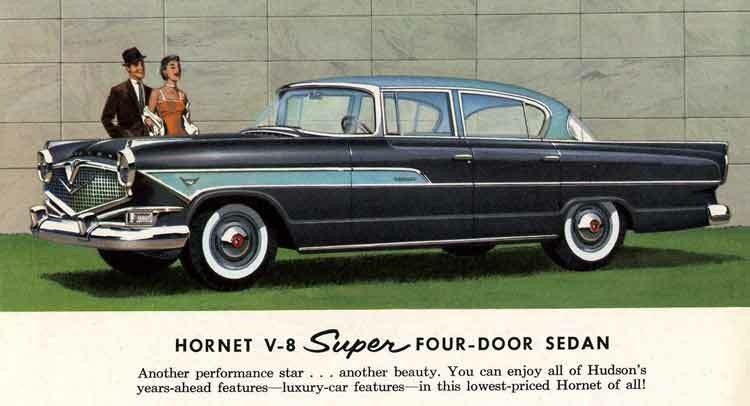 A total of 16 two-tone paint jobs was available as well as front foam cushioning for the Deluxe models. Seat belts, travel rack straps and Child Guard door locks were all optional equipment, too. 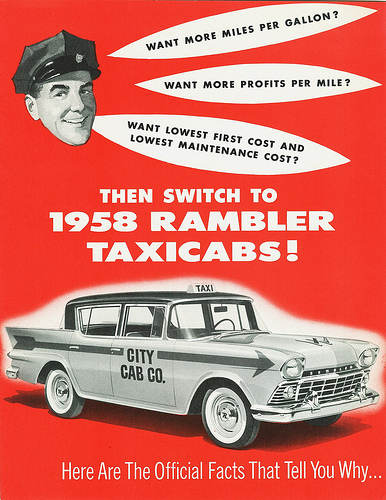 With a list price of $3,459, the Rambler Rebel Cross Country Station wagon found plenty of owners in 1958. Colours for Deluxe and Super models were Classic Black, Brentwood Green, Lakeshore Blue, Mardi Gras Red, Gotham Grey Metallic, Frontenac Grey, Frost White, Kimberley Blue Metallic and Saranac Green Metallic. In addition, Custom models also came in Cinnamon Bronze Metallic, Alamo Beige, Autumn Yellow, Georgian Rose and Mariner Turquoise Metallic. It would be a great year for American Motors of Canada Limited. With 5,389 units delivered, Rambler would shoot up to 15th place in calendar year sales, ahead of Studebaker and behind Morris. In addition, Metropolitan sales added another 1,777 units to the final 1958 figure.